Traditionally tempeh is made with soybeans, so that is what I’ve used here in this recipe, but pretty much any kind of bean can be used. 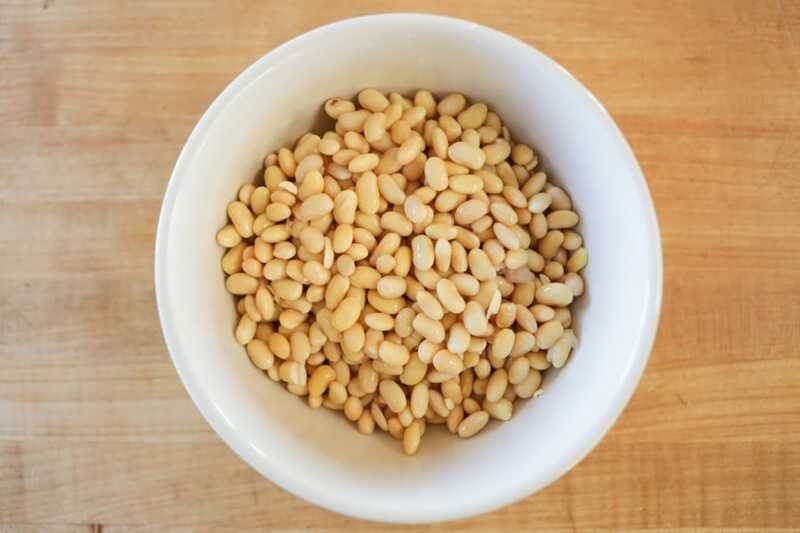 I haven’t tried them all but chickpeas (garbanzo) and lentils should work just fine for you. 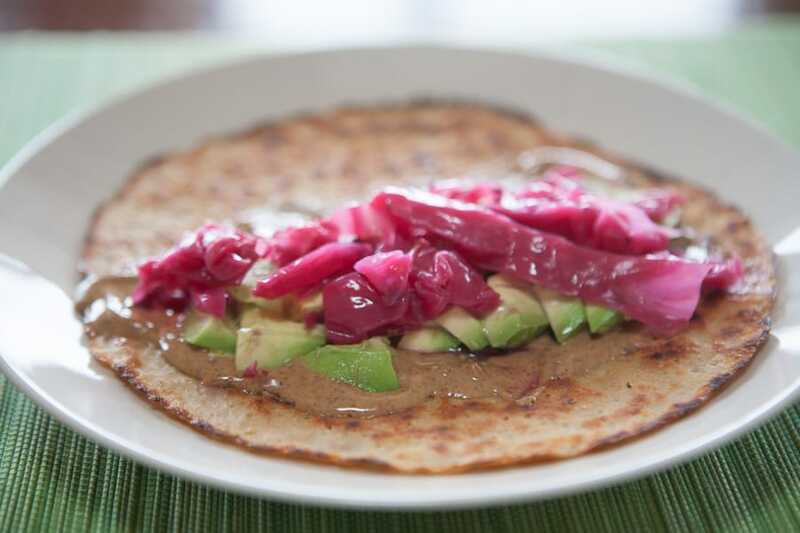 You can even mix in some grains so there is a lot of room for creativity. 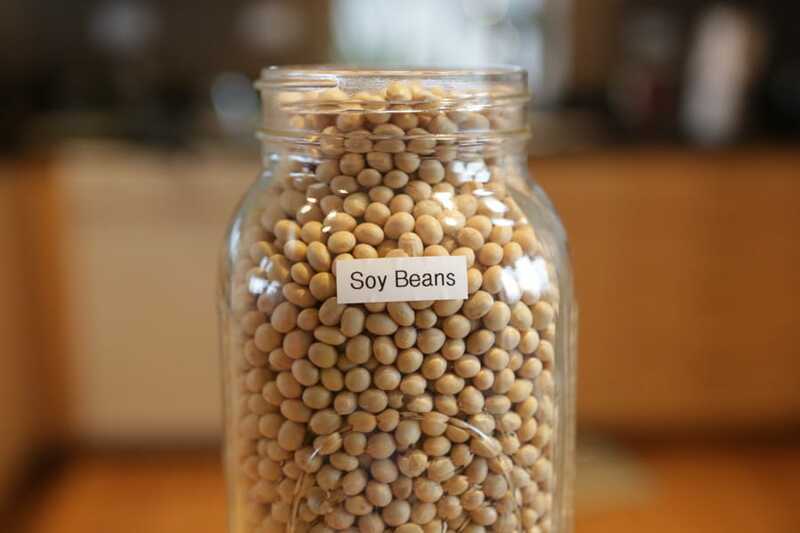 Soak the soybeans - place the soybeans in a large bowl or pot and cover with plenty of water as the soybeans will expand. Soak for 4-6 hours or more. I usually soak mine overnight. The soybeans start out as these small roundish beans but when they expand through soaking they become much more oblong. Remove the soybean hulls - the soybeans have a casing which needs to be removed for the culture to be able to grow on the beans. 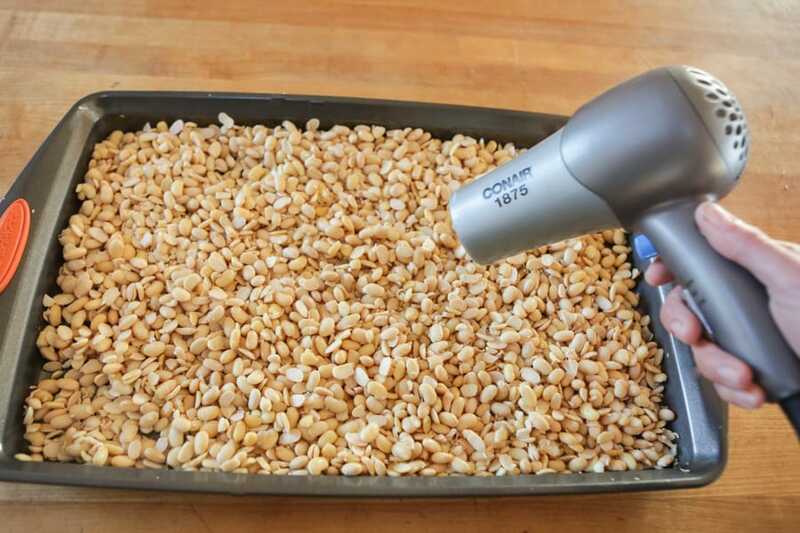 To remove the casings, simply massage the beans firmly between your hands. I usually do this while they are in the water. Many of the beans will split in half during this process which is fine. You'll need to do this for a few minutes. It is OK if all the bean casings are not removed but shoot for removing at least 3/4 or more of the casings. Use a strainer and scoop repeatedly through the top of the water to capture the floating casings from the water. Don't worry if you leave some of the casings behind. They'll simply add more fiber to the end product. Cook the soybeans - Place the beans in a pot of water and bring to a boil. Reduce heat and simmer for about 40 minutes. The important thing to be aware of here is to not overcook the beans. You want them "al dente," just about ready to eat, but not at all mushy. I've tried using a pressure cooker to expedite the cooking and it's tricky unless you are really on top of it. I'd suggest about 6 minutes in a pressure cooker with natural release, but you can't leave them sit long after the pressure comes down or they will continue to cook. The main reason to not overcook the beans is that there needs to remain airgaps between the beans for ventilation and for the mold culture to be able to weave it's way through and bind everything together. 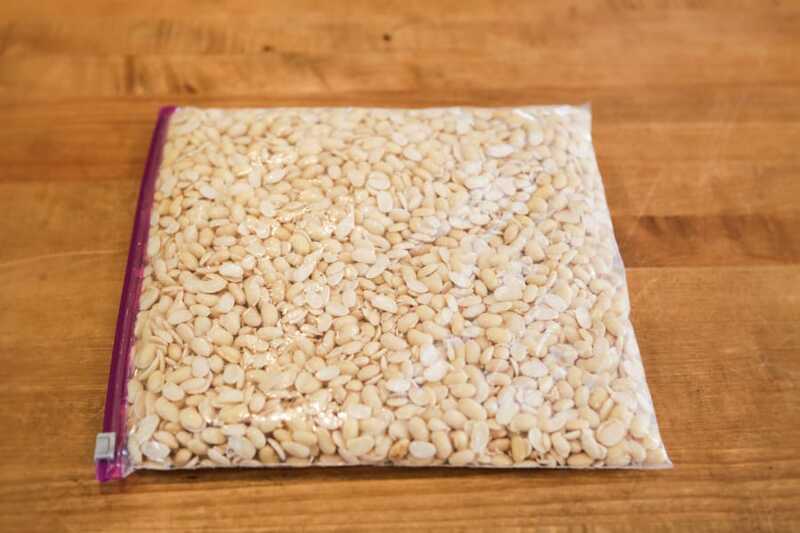 for drying the beans is to cook a half a cup of rice in a 1-1 rice water ratio and then add those still thirsty grains to the beans and mix together. 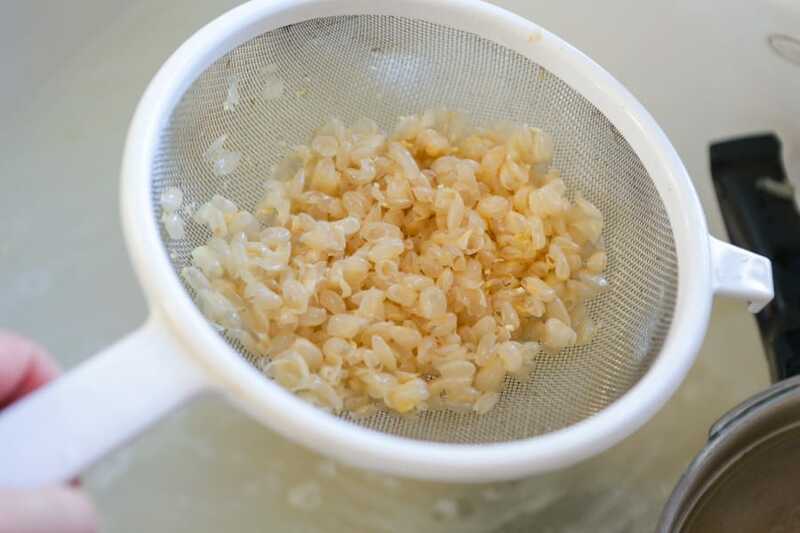 The rice can then absorb some of the extra surface water from the beans and still works fine in the final tempeh product. 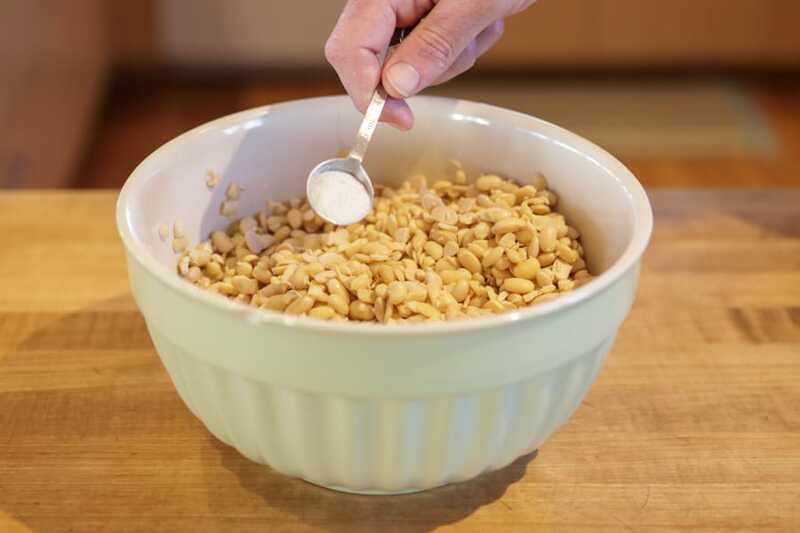 Add vinegar and starter - Place the beans into a large bowl and toss with three tablespoons of distilled vinegar and toss. Add the Tempeh Starter and mix well to distribute the starter well throughout the beans. 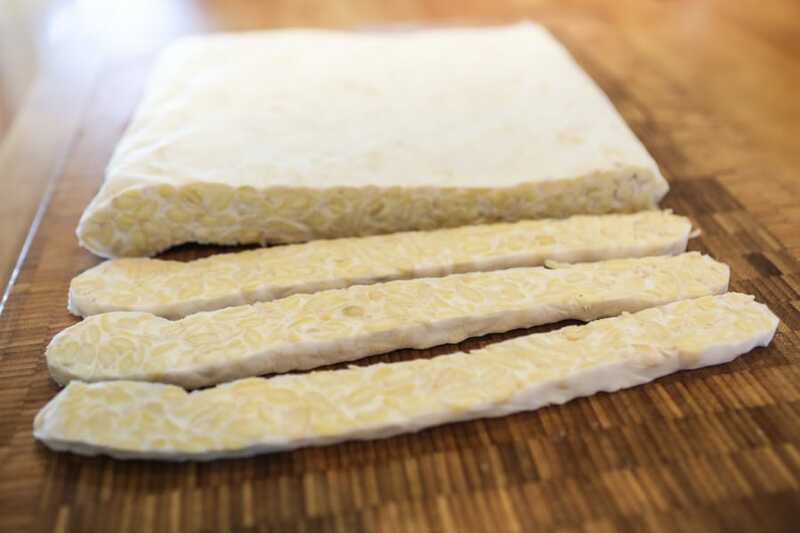 Form the tempeh - The amount of beans in this recipe is perfect for a 1 gallon ziploc bag. Place the mixture into the bag. I've also used aluminum tin pans covered with aluminum foil for this. Poke holes in the bags - To allow ventilation, perforate the bag approximately every one inch with a sharp pointed object. Do this to both the top and bottom. Place in an incubator - The ideal incubation temperature is approximately 88F degrees (31C) degrees. 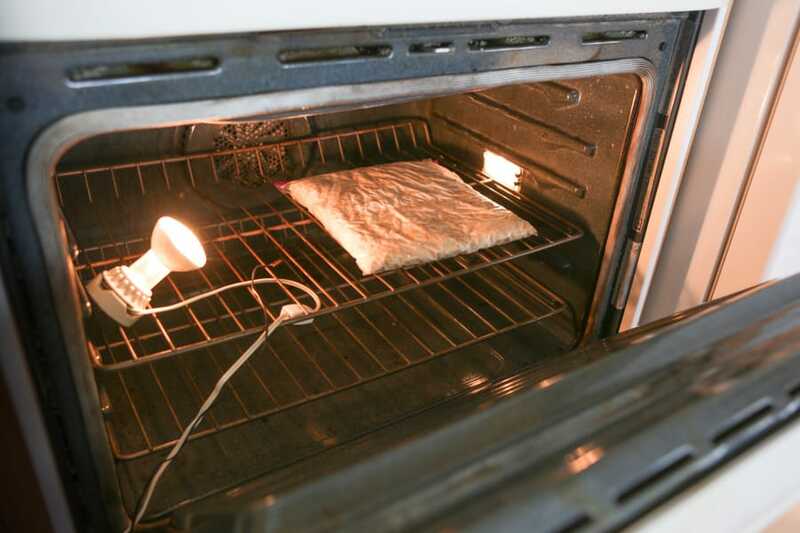 See "How to make your own fermentation incubator" for ideas on making your own incubator. This fermentation will also generate it's own heat in the process which is one of the reasons I've come to prefer this temperature rather than a slightly higher one which others may recommend. Wait impatiently - The fermentation will take approximately 21-24 hours. You'll know it's done when the entire mass is covered in a nice white fuzz. If it takes longer, no worries. I've had tempeh take as long as 48 hours in the past. If left to incubate longer, you may see some grayish areas beginning to form and grow. It is very likely that the mold has begun to sporulate. If so, it needn't be a worry as far as eating is concerned. Congratulate yourself! - ...and do your own special "Happy Dance." Nice job at spreading your fermentation wings a little further! 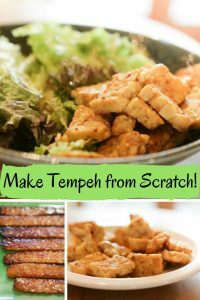 Tempeh has definitely become a staple in my largely vegan kitchen, but that doesn’t mean only non-meat eaters will enjoy it. 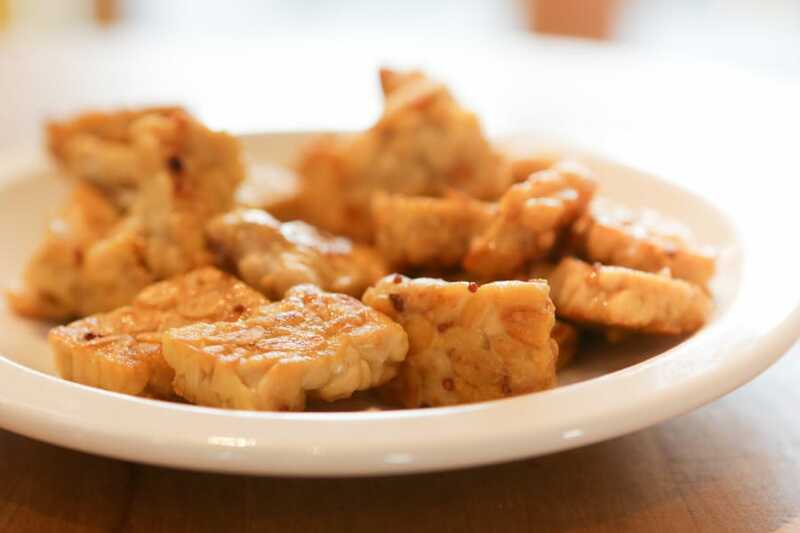 Tempeh has a great capacity to absorb many flavors so you can marinate it in advance in your favorite sauce. Nothing beats a little BBQ sauce to make a regular meat-eater happy. When pan sautéing, I prefer to simply cook the tempeh in a little oil and then toss it with a pre-mixed sauce immediately after. 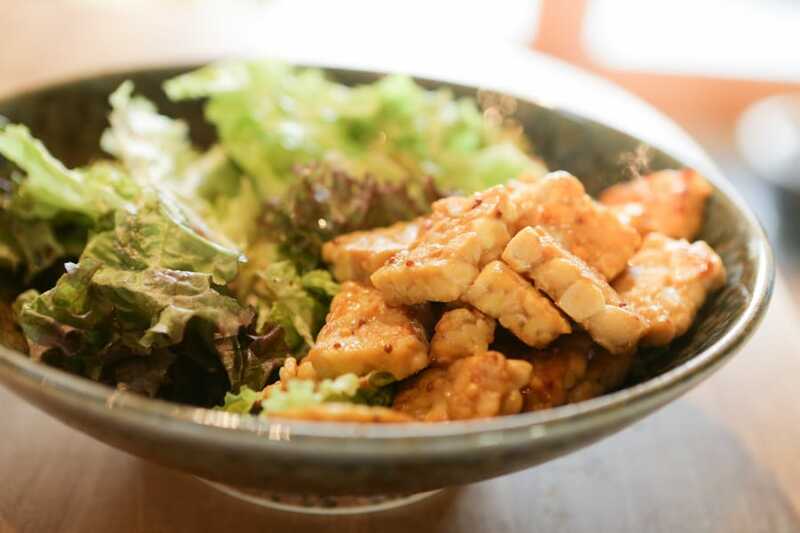 Honey-mustard mixed with a little olive oil is a nice combination, or add an asian flair with soy sauce, toasted sesame oil and a little rice vinegar. 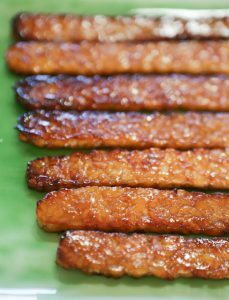 Making Tempeh Bacon can be a delicious taste treat by tossing with a little oil, smoke flavoring and maple syrup. Trust me, it’s delicious and can make for a great Bacon Lettuce and Tomato (BLT) sandwich. Tempeh Reubin Sandwiches are a great option too. 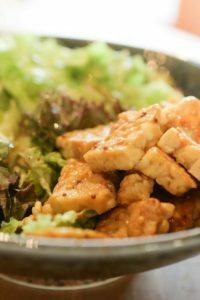 Most of the time when I eat tempeh, I’m usually making a healthy salad, by preparing some lettuces and kale, cooking some tempeh, tossing the tempeh in a sauce and mixing the sauced-up tempeh into the salad. This is pretty much my favorite lighter yet satisfying meal these days! This looks so simple! Excited to try it. Would it work just as well if I lined the plastic bags with parchment paper? I’m trying to avoid a lot of plastic-food contact these days. Thanks! Understood. You don’t have to use plastic bags. You need a form of some sort that has holes poked in it. 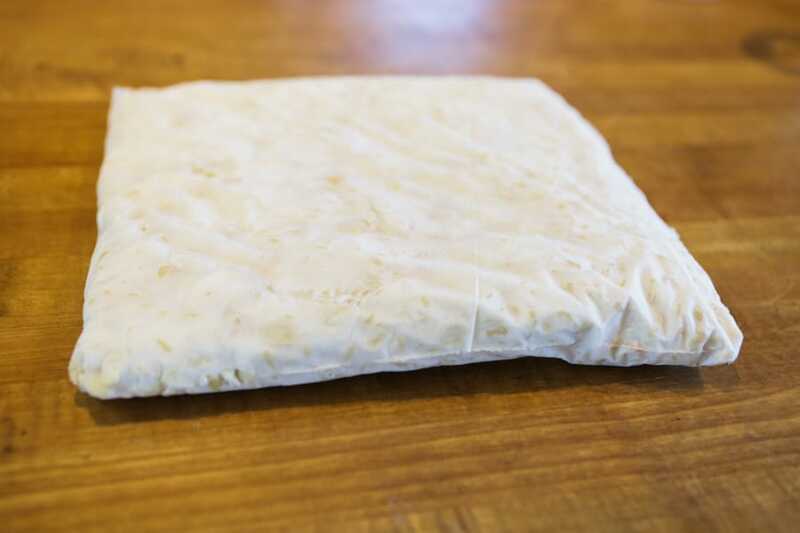 When I first started making tempeh, I used cheap aluminum disposable baking pans topped with aluminum foil with holes poked in them. Some folks have used tupperware. Not sure about lining the bags with parchment paper, but it you can pull it off, I think it would work fine. Make sure the holes in the bag line up with the holes in the parchment paper so it an breathe/vent properly.